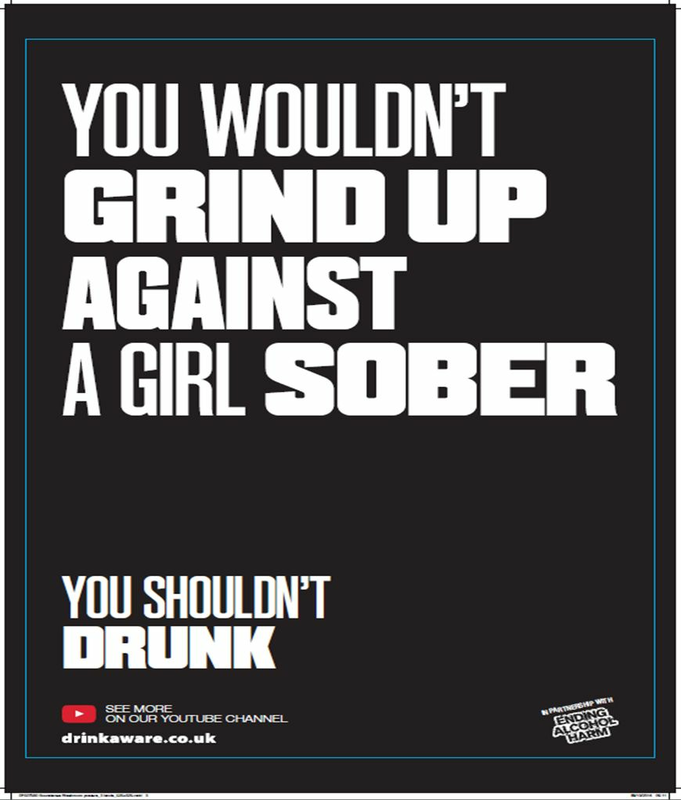 Being drunk is no excuse for sexual harassment on nights out; it’s time to put a stop to it. As almost half a million new students look forward to Freshers’ Week, new research into binge drinking among young people highlights the extent of unwanted sexual attention on drunken nights out and tolerance of this criminal behaviour. As the charity Drinkaware launches Drunken nights out: motivations, norms and rituals in the night time economy, an independent review of binge drinking, it warns that being drunk is not an excuse for sexually harassing or assaulting other people. This criminal behaviour should not be tolerated; if it’s not acceptable sober, it’s not acceptable drunk. It’s not just students who are affected. Nearly a third of young women (31%) aged 18-24 said they received inappropriate or unwanted physical attention or touching on a drunken night out in a survey conducted by ICM for alcohol education charity Drinkaware (1). Very few (19%) of those who have experienced this said they were surprised when it happened to them. In addition, more than a quarter of young women (27%) have put up with inappropriate sexual comments or abuse on a drunken night out. Young men aren’t exempt either. 11% said they had to deal with inappropriate or unwanted physical attention or touching and 8% received inappropriate sexual comments or abuse. Most young people (66%) said that persistent unwanted sexual attention ruins a good night out. Young women who experienced this said that unwanted attention on a night out made them feel disgusted (69%) they also reported feeling anger (56%) and fear (39%). The independent review commissioned by Drinkaware found the problem doesn’t end with molestation and groping. More than 40% of people who have experienced sexual assault believed their assailant to be drunk (2). The survey highlights that drunkenness is an integral part of a night out for many young people. 82% of 18-24 year olds who drink will always or almost always drink alcohol when they go out; 35% said when they go out, those occasions are always or most often drunken nights out. The review highlights the pressure on young people to drink as much as everybody else and stresses that, among young people, taking part in drunken nights out is essential if you want to be part of some friendship circles. Half of young people questioned in the survey (50%) said a typical night out involves drinking with friends before going out. For almost a third, it also means playing drinking games (32%) and 27% describe a typical night out as one where they lose count of how much they’ve had to drink. ‘People should be able go out and enjoy themselves without fear of becoming a target for a sexual predator. Being drunk is no excuse for someone behaving in a criminal way. ‘Making a complaint of any kind of sexual assault can be daunting for a victim, which is why so many sexual assaults go unreported. We are committed to helping victims find the strength to cope and have the confidence to report these crimes.